Although the government is undertaking far-reaching reforms, Myanmar still has huge problems to overcome. Travel for foreigners is generally very safe, with amongst the lowest crime rates in Southeast Asia. But corruption and entrenched interests are widespread; HIV/AIDS is prevalent amongst parts the population; child labour remains all too common; and there is inter-ethnic conflict and illegal drug production in remote areas. If you are concerned about the political situation and where to spend (and not spend) your money, the best way is to keep yourself as informed as possible. And you can also check out Amnesty International, Burma Campaign UK, and Info Birmanie (en français). When travelling in Myanmar, the best way to ensure your money reaches the people is to support local communities – buy local products and eat where locals eat. Some of the ills that Myanmar still faces happen in the background or out the of view of tourists – but as you travel around the country, you may find that you are confronted with issues such as child labour, the insensitive renovation (or even destruction) of historical structures, and unpleasant, uncollected litter. Whilst always remaining polite and sensitive to the Asian concept of ‘saving face’, you should feel free to raise these concerns with locals, particularly those in authority. In the long term, it can make a difference. It is important to be aware that entrance fees, which are sometimes paid in US dollars and are charged when entering many popular destinations such as Bagan and Inle Lake, go to the government. Some say that this is absolutely a bad thing, but in today’s environment of change, the truth is more nuanced; the government of Myanmar is far from perfect, but it is now actively seeking advice from NGOs and European governments on responsible tourism and development. If you want to find out more about responsible travel in Myanmar, check out this online guide of dos and don’ts for tourists; for more information on cultural sensitivities, go to our section on cultural differences and adapting to life in Myanmar. Myanmar people want you to visit! Having previously encouraged people to stay away in order to avoid lining the pockets of the military, Aung San Suu Kyi now welcomes responsible travel to Myanmar, encouraging tourists to use facilities that help ordinary people and avoid businesses that have close links to the military. Above all, you should know that the people of Myanmar want you to visit! When travelling it is almost always feasible to pay money to local, independent shops, tour guides, hotels and guesthouses. Not only do your tourist dollars go a long way, but also locals are endlessly curious about foreign visitors and are delighted to engage with them about almost anything. Our aim is to create dynamic and ethical tours whilst providing the highest possible level of customer service. Central to our ethos is providing opportunities for Myanmar locals, whether our own staff in Yangon or guides, suppliers and other tour support around the country - and aid their career development through on-the-job training and responsible travel programs. Wherever possible, we use indigenous ethnic guides – contributing to the local economy in remote areas (that are frequently impoverished) and giving our customers a more inciteful and enjoyable experience. Go-Myanmar.com trains its guides and staff in responsible travel practices, including ethical and sustainable tourism development; culturally sensitive issues; and waste control and resources control. 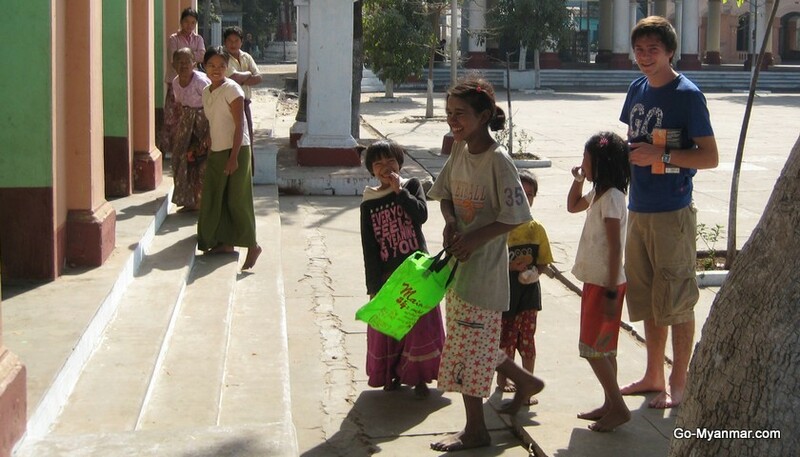 In addition to the Myanmar practice of alms giving, Go-Myanmar.com donates both money and gifts to monastic schools at various locations that our tours go to (a monastery education is often the only kind available in many villages around the country). We also contribute to emergency relief funds and aid giving as situations arise, giving money, food and clothing through Yangon-based Volunteering Network. We are proud to partner the Business Innovation Facility (funded by UK aid) and responsible businesses around Myanmar on the Go-Myanmar.com Travel Hub network – places for visitors to get unbiased, reliable tourism information. We are founding sponsors of a fun and pioneering project: Yangon's first community skate park. You can see our video here. We are involved with the American Center Yangon's internship program - providing opportunities and career training for young locals in Yangon.